The Blue Jay by Deer Creek is a quintuple cream blue cheese. Yes, you read that right. And you thought triple cream was rich! Meet The Blue Jay. 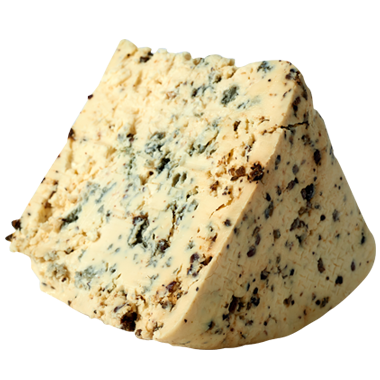 We know and love many cheeses that incorporate fresh green herbs like dill and chives, of course, but rich and creamy Blue Jay prefers to fly among the juniper trees. This beautiful blue’s piney notes all derive from those strong-willed blue berries, which are crushed and infused into it. We adore this bold, botanical Wisconsin blue, especially when we’re sipping on chilled juniper-kissed gin. Blues are higher in moisture than you might think, so they’re a bit more delicate than a hard cheese. Don’t store The Blue Jay in plastic. We prefer waxed paper or aluminum foil so that it can breathe, and have more room to flap its wings! Like most blues, The Blue Jay pairs well with off-dry beverages with a bit of fortitude and flavor. A crisp hard cider is an excellent choice. If we’re drinking beer, then amber ales, bocks or fruit beers work well. For wine, we prefer fizzy champagne and cava, or slightly effervescent vinho verde. Surprisingly enough, a nutty, and on-the-bold-side, sake gets along brilliantly with The Blue Jay too. The Blue Jay can take flight solo by itself or join forces with cooked meats and pastas, for example. It has enough heft to complement game meats, thick-cut steaks and lamb burgers. If you serve it on a board, we’d steer you toward thinly-sliced pear, figs, dried Wisconsin cranberries, candied walnuts and wholegrain crackers.